Concrete Collective is a newly founded art and design collective made up of three MA multi-disciplinary printmakers: Gen Harrison, Graham Cook and Ella Sparkes. The exhibition features a strong mix of the photographic and graphical expressed through the process of print. 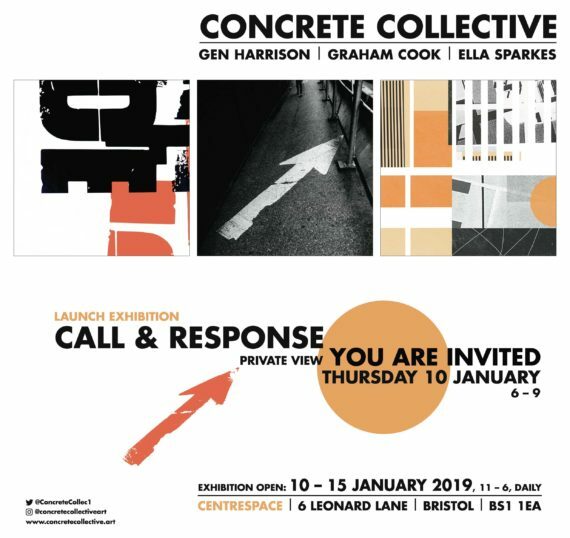 Call & Response sees Harrison, Cook and Sparkes draw on a common interest in the city to explore narratives of navigation, construction, and individual interaction within a public space. The work seeks to start a conversation with the built environment and those who occupy and inhabit it. What is the language of a city? How does it speak to us as we journey through? How do we respond? What happens to our transit as the city transitions? What is the perception of public space? How do people ‘own’ it and exploit its possibilities? Are we influenced, architecturally, in our thinking?